Blue. With separate wings. Scarab in blue glazed faience, with separate wings, the details of the latter carefully marked with primary and secondary feathering, and attached with modern string. 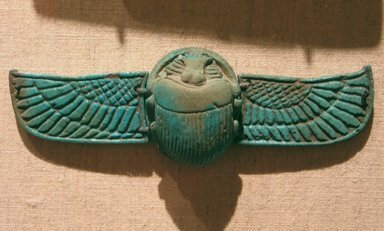 The scarab is pierced top and bottom and on both sides for the attachment of the wings. Back: clypeus notched, plate (hatched), head and eyes marked. A single line between the elytra, descending to the base, a single line between the prothorax and elytra. The elytra are striated. Side: legs molded in bold relief, all feathered. The tip of each of the wings is pierced.